If your roofing system has been damaged by a storm, is suffering from a stubborn leak, or has simply reached the end of its functional service life, call the experts in roofing New Westminster homes – Crown Roofing. We will be happy to provide a professional assessment of your roof and make recommendations for repairs to extend its life, or options for replacement to make sure your home and family are properly protected from the weather. 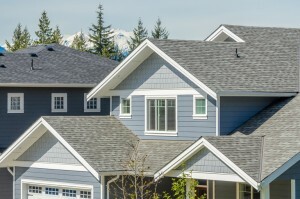 Crown Roofing has been successfully roofing New Westminster homes since 1902 – over 100 years of experience! Thousands of your neighbors will sleep more comfortably and peacefully under a Crown roof tonight. 1. We install only quality materials from trustworthy manufacturers, including GAF Corporation and Owens Corning. This ensures that your roof will provide the protection you expect for many years. 2. We provide “above and beyond” customer service. Roofing can be a mysterious and unknown process and it is easy to be “taken in” by a roofer who may not be able to deliver quality work. At Crown Roofing we take the mystery with open and honest communication, treating you with respect and dignity from start to finish. 3. We back up our work, both with manufacturers’ product warranties and our own guarantee of satisfaction. We’ve been here for our customers for over a century, so you know you can count on us being available to you as well. 4. We deliver value. Quality work at fair prices is how we’ve built our reputation as the first choice for roofing in New Westminster. Let us prove it to you! Whether you have an immediate need for roof repairs, or are planning to replace an older roof with a more efficient roofing system, we’d be happy to provide you with a written estimate at no obligation. Call Crown Roofing today at 604-370-6288 to schedule a free on-site assessment and estimate. Save up to $500 on a GAF Roof Replacement! Copyright 2008-2010 Crown Roofing LTD.